Synopsis: Darcy Barrett has travelled the world, and can categorically say that no one measures up to Tom Valeska, whose only flaw is that Darcy’s twin brother Jamie saw him first and claimed him forever as his best friend. Despite Darcy’s best efforts, Tom’s off limits and loyal to her brother. When Darcy and Jamie inherit a tumble-down cottage from their grandmother, they’re left with strict instructions to bring it back to its former glory and sell the property. Darcy soon finds a familiar face on her porch: house-flipper extraordinaire Tom’s arrived, he’s bearing power tools, and he’s single for the first time in almost a decade. Suddenly Darcy’s considering sticking around to make sure her twin doesn’t ruin the cottage’s inherent magic with his penchant for grey and chrome. She’s definitely not staying because of her new business partner’s tight t-shirts. Soon sparks are flying—and it turns out one percent of Tom’s heart might not be enough for Darcy anymore. This time around, she’s switching things up. She’s going to make Tom Valeska 99 percent hers. Darcy was an extremely likeable character. She was rough around the edges and I found her outlook on life and her emotions quite amusing. She was honest in a brutal but effective manner which I think complemented Tom nicely. At times they seemed polar opposites and I liked this dynamic, especially in certain scenes. There was a lot of sexual tension between the two of them and as with THG, it was sooooo good. BUT, I felt like they got together too close to the end of the book for my liking, I would have liked for them to have come together a lot earlier on. HA! I loved this book. 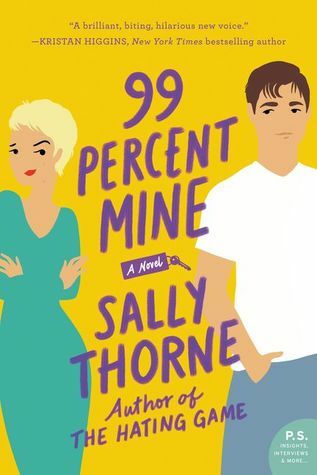 But I have to compare it to THG, which was funnier for me and it flowed a little better too but this is still a great book, perfect to add to anyone’s romcom collection.